As you get ready to hibernate for the winter, now is the time to consider upgrading your favorite hibernation spot—your family room. One of the best ways to stay cozy and happy is to seek out the creation and installation of a custom entertainment center built around your needs and your home. We often hear the question, “But wouldn’t it be cheaper to alter stock cabinets?” Sometimes the answer may be yes. But most often, it’s no. Here’s why—you have to spend a great deal of time and energy altering the look and function of stock cabinets to get them even close to the entertainment center you actually want. 1. You gain a center built to meet your needs. Whether you are a movie buff or an old-school LP fan, a master carpenter and cabinet designer can work with you to skillfully craft a piece that provides all the storage you need for all of your media items. You can also request special items such as removable or adjustable shelf dividers so your center can grow along with your expanding collection of movies, music or video games. 2. You choose what stands out in your room. Are you a big Sunday football fan? Does that mean you have more than one television to prominently display? Or perhaps you’re more of a minimalist who prefers to hide away technology until you need it? Whatever your desires or pastimes, you get to ensure that your new entertainment center meets all of your viewing requirements. 3. You choose how your center works. Unlike manufactured pieces that are big, clunky and often a beast to maneuver, your custom piece can have numerous features that make it a breeze to use. Consider rollout shelves, custom storage areas, quiet-closing drawers and cabinet doors, and more. 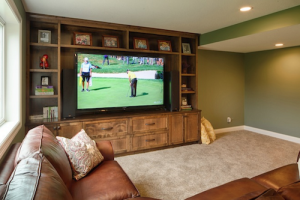 When you need a way to store and organize your entertainment center, turn to a master carpenter for a beautifully functional built-in media center that you’ll be happy to brag about for years to come. 4. You hide all of those unsightly wires. One of the greatest glories of a custom entertainment center is that it effectively hides all those wires tied to your flat-screen TV, cable box, game consoles, surround sound system and more. So instead of staring at all of the wires, you can sit back and enjoy the show (or game, etc.). What Do You Love About Your Media Center? Do you have a custom media center in your home? If so, what do you love about it? Share your comments and pictures of your space with us on Facebook or Pinterest. We keep our social profiles updated with great news from Artisan Cabinet Company and interesting articles about custom cabinets and remodeling. Connect with us to get the latest information! If you are interested in our custom cabinet services, we are only a phone call away! Call us today and we will make sure that you and your family receive the cabinets that you have always wanted!